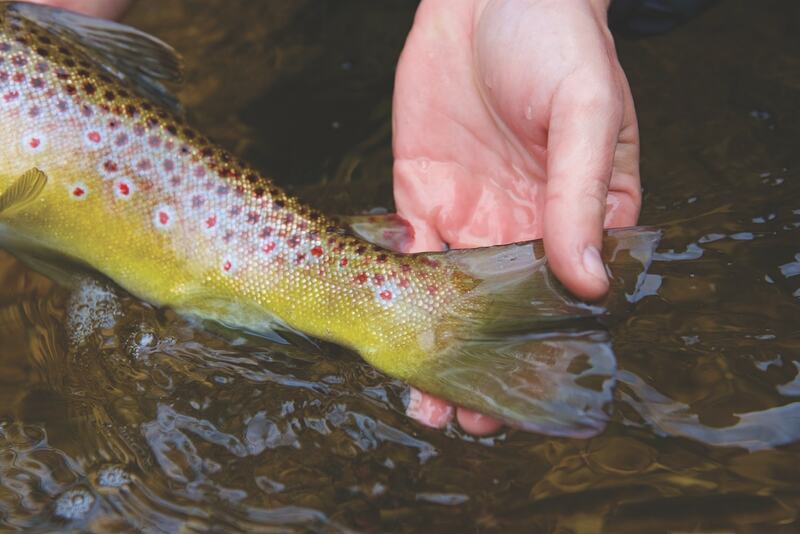 Find a stretch of open-year-round trout water, and test your skill with a flyrod and a streamer. Subscribe to life outdoors—fishing, biking, hiking, hunting, paddling—with Traverse, Northern Michigan’s Magazine. For the outdoor enthusiast in Northern Michigan, November is one of the most exciting months of the year. Hunting, fishing, surfing and kiteboarding are all picking up. If you are unsure of what to pursue, I would recommend trout fishing. 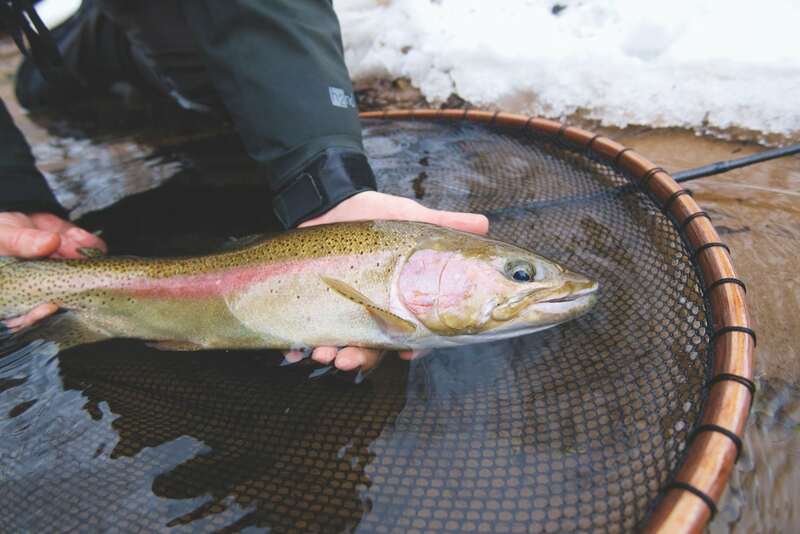 Some of the biggest trout of the year can be caught during this time of year on streamers. Fall is a major spawning time. There are typically a few salmon still laying eggs, and the brook trout and brown trout are starting to move from cover to spawn. As this shifting around of the river occurs, fish can be more aggressive than normal. While it is unethical to fish for trout that are spawning on their redds, there are still plenty of fish against the banks and in the holes that are waiting to ambush a large meal. (A redd is a bed where trout lay their eggs.) The fish will protect their redd and attack anything that comes near it. Spawning fish should be left alone so they can save their energy to fend off other predators that might swoop in to eat the eggs. 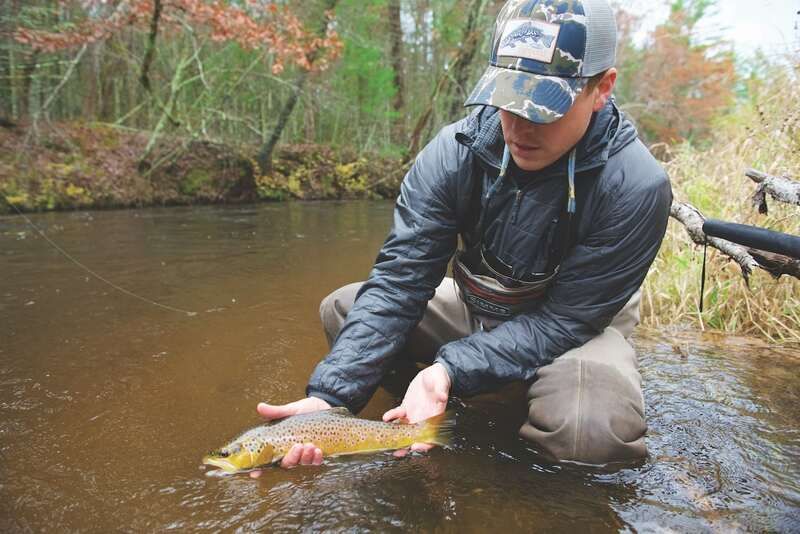 Fall also offers some of the best conditions for streamer fishing. November is typically overcast a few days a week, which can produce action all day long. As the rain starts and river flows fluctuate, fish often go into a feeding frenzy. It is not uncommon when a fish is caught to find its mouth stuffed full of bugs. They gorge themselves when the food is plentiful. One thing to keep in mind about fishing this time of year is that as river temps begin to drop, fish can become more lethargic. So slowing up your stripping speed will be more effective than a faster retrieve. Everyday is different, but large articulated streamers seem to produce consistently. I prefer yellow streamers, but both olive and black can work extremely well, too. 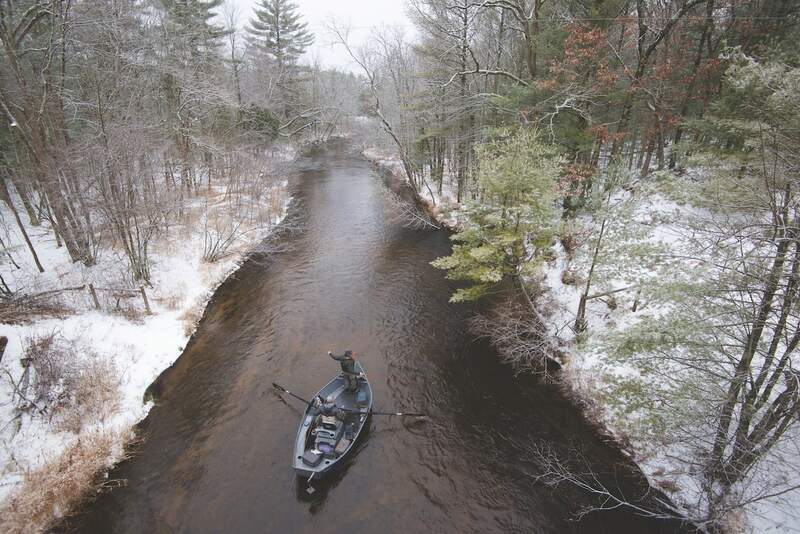 There are many sections of river that are open year round, but the “fly only” water on the Upper Manistee near Grayling is hard to beat. For your first time fishing that stretch of river, I would recommend getting a guide. The Northern Angler in Traverse City and the Old AuSable Fly Shop in Grayling are both solid options for a guide service. The guides are great people and will do their best to put you on fish. A fast action rod is the best for streamer fishing for trout in Northern Michigan. The sections of river open to trout fishing this time of year are often smaller and don’t offer much room for back casting. A roll cast fits the bill nicely. A perfect rod for the money is the Redington Predator rod. It is easy to cast, has decent action and control, and comes with a lifetime warranty. A good sink tip line is important in casting and getting the fly down to the fish. Rio Products offers an Out Bound Short line that casts with ease and is very forgiving when casting large streamers. It roll-casts effortlessly and can easily toss most flies you put on the end of your line. Daniel Shepler is a Traverse City native whose passion for capturing adventure has taken him all over the world writing and photographing for marketing and editorial projects. danieljshepler@gmail.com.